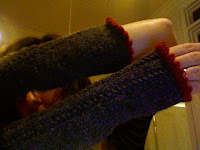 After a delightfully quirky request from a friend in Melbourne last week I embarked on these arm warmers yesterday. 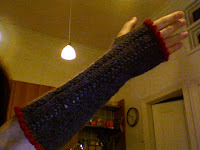 Here is the original Pattern by Cinnamonamon for the picot-lace-arm warmers – they are in a 10ply and Frippet and myself wanted something lighter weight. 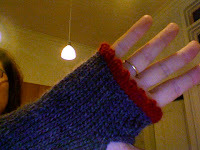 I had to source the exact colour yarn as requested and Beth from Morris and Sons helped with the grey when I bought the red from there last Thursday. She had lots from an op shop purchase. I am getting some Madelinetosh sock yarn in exchange – fair deal I think. So pattern picked, colour decided and yarn sourced it was all systems go. 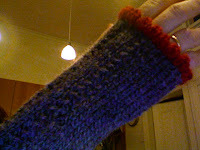 Last night I swatched and then rewrote the pattern to suit my style of knitting – basically knitting from the arm up and with increases instead of decreases and to fit the recipient. Note bold is 8th May changes as I reread pattern this morning to check for errors. 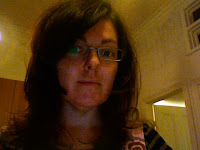 new hair cut today too………..
Great looking arm warmers and the haircut looks good too. oh they are gorgeous! Delightful. I think I need some.